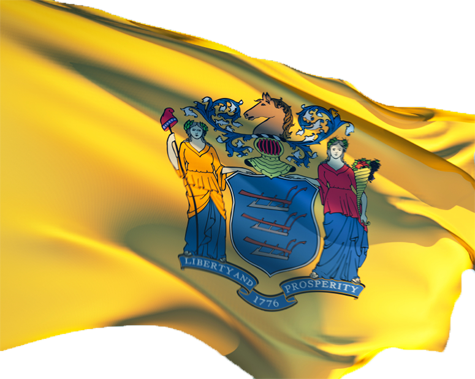 The beautiful buff color of the New Jersey State flag dates all the way back to 1779 and the New Jersey Regiments mustered for the Revolutionary War. The color was chosen by General George Washington when he was directed by the Continental Congress to prescribe the uniform for the regiments of the New Jersey Continental Line. General Washington directed that the coats of the soldiers should be dark blue faced with buff. These colors were chosen by General Washington to honor the original Dutch settlers of New Jersey. Dark Blue and Buff were the colors of Holland or the Netherlands. On February 28, 1780, the Continental War Officers directed that each regiment should carry two flags; one that of the United States and the other a state flag that should be the color of the Uniform facing and the New Jersey State Flag has carried that color with it for over 200 years. 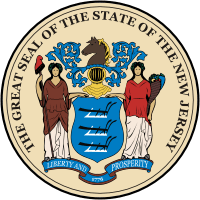 New Jersey made the flag official in 1896 and described the flag in a joint resolution of the legislature. It was supposed to be a rally at an East Orange church about raising the minimum wage in New Jersey. But the focus of the event Wednesday shifted immediately to both the U.S. Senate and governor races in the Garden State with the appearances of Newark Mayor Cory Booker, state Assemblywoman Sheila Oliver and state Senator Barbara Buono. While the organizer of the event, Charles Hall, tried to keep press questions focused on the minimum wage issue, it was only a matter of time before reporters were aiming their queries at all things politics, especially when it comes to two U.S. Senate candidates under the same roof. When Mr. Booker and Ms. Oliver were each asked about appearing at the same venue, they gave polite answers stressing their coming together for the common cause of getting the ballot initiative approved in November to raise the current wage from $7.25 per hour to $8.25 per hour. Ms. Oliver brushed off any notion of tension from being in the same room as Mr. Booker, who has emerged as the frontrunner for the special election in August. On the issue of Mr. Booker getting endorsements such as one on Tuesday from Ms. Oliver’s longtime colleague Stephen Sweeney, Ms. Oliver didn’t see that as an obstacle. “Endorsements don’t vote for people, registered voters in the state of New Jersey are the ones who come to the polls and cast their ballots,” Ms. Oliver said. And then there’s Ms. Buono, who will face off with incumbent Gov. Chris Christie and apparently is not looking to insert herself into another election.